Positron emission tomography (PET) is a nuclear medicine technique that provides a non-invasive way to diagnose and design treatment for tumours. The technique monitors how positron-emitting radionuclides bound to biological targeting molecules accumulate in the body. The radionuclide accumulates in cancerous tissue, and its concentration provides both qualitative and quantitative information about the tumour. At the Institute of Cancer Research in the UK, Graham Smith and co-workers have now taken this isotope one step closer to the clinic by automating the process. Using two different radiolabelling platforms, they’ve successfully labelled three substrates and achieved over 98% radiochemical purity. This could allow them to produce large batches of radiopharmaceuticals for satellite PET centres around the country. Automated procedures are a requirement of good manufacturing process-compliant radiopharmaceuticals; enabling batch reporting and record keeping, control and standardisation of processes, and reducing the risk of contamination. 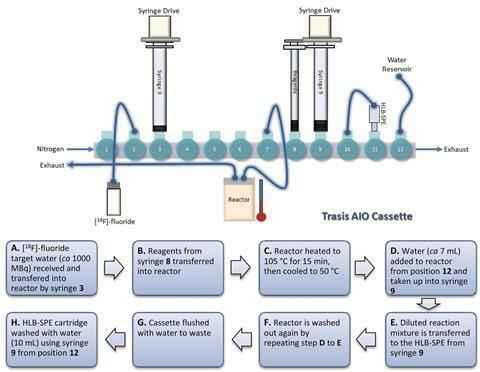 ‘Removing the human interaction from a process provides a reproducible production time and a standardised approach to radiosynthesis,’ explains Smith, who believes his technique will allow more widespread use of fluorine-18 in the clinic. ‘There will be a direct patient benefit due to the superior decay characteristics of fluorine-18 over comparable radioisotopes such as gallium-68,’ he adds. The team hopes this process will provide a foundation for automating radiopharmaceutical production, enabling huge advances in patient diagnosis and treatment.